Throughout Canada, the Provincial Ministries of Transportation, the Municipal Engineers Association (MEA), other organizations representing contractors, consulting engineers, manufacturers, and their associations follow specific design specifications and criteria to create consistent transportation designs and reconstructions. To address the specific needs such as 3% subgrade, superelevation based on lane, shoulder & subgrade relationships, SolidCAD has developed the critical key components for AutoCAD® Civil 3D® to help you drive transportation projects better, faster and more affordable than ever before. 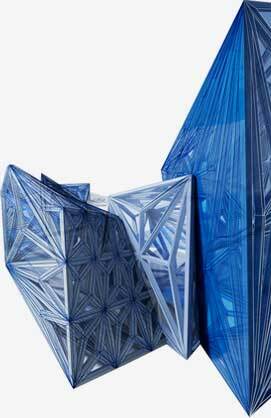 The subassemblies are available for different versions of AutoCAD® Civil 3D® (2014 to 2017). Superelevation calculations in certain jurisdictions can be tricky because the links of the granular and subgrade (datum) must coordinate with the superelevation of the pavement surface, especially during the transitioning of lane from a normal (tangent) section to the fully superelevated section. The lane shoulder cross-fall is another variable where the relationship between the lane and shoulder crossfalls may not be always linear. The first ripple of superelevation data is derived from the Alignment Properties dialog box in Civil 3D. Then we use the OPSD superelevation relationship tables coded in the subassemblies for any slope-to-slope relationship between two links. The subassembly with 3% subgrade is ideal for roads, intersections and driveways or other similar scenarios with no curb and drain. The subassembly with 3% subgrade with curb and drain. The subassembly with 3% subgrade, superelevation calculated along with curb and drain. The subassembly with 3% subgrade going in reverse direction, is ideal for specific scenarios similar to intersection and roundabout design. 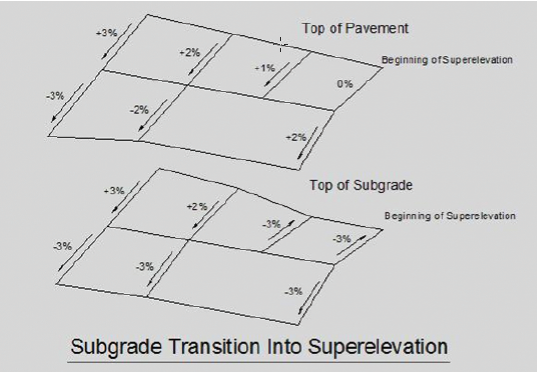 SolidCAD has incorporated the critical superelevation relationship table for the lane and shoulder subgrade directly into the individual subassemblies that are used in superelevation. The subassembly is design with 3% subgrade, superelvations calculated & assigned based on OPSD (Ontario Standards). The Subassembly with 3% subgrade going in reverse directionwith superelevation for use in typical scenarios. The shoulder subassembly is designed with 3% subgrade, superleevations calculated & assigned based on OPSD (Ontario Standards). Each of the above listed subassemblies can be used for urban, rural and highway road design. The superelevated sections could be easily generated for undivided rural section, fully and partially paved shoulders. The SolidCAD Rock Cut Assembly models a complete undivided highway section in a single Subassembly. One to three superelevated lanes each direction; superelevation for the 3rd lane is calculated on an offset target alignment. All lanes can use offset targets to control width. The bottom of thesubgrade layer is held to a maximum slope of -3% by default regardless of the lane superelevation rate. Shoulders are superelevated based on the superelevation rate of the outside-most lane on the same side using the Ministry of Transportation (MTO) shoulder superelevation rate table. Stripping of the EG surface with critical depth, existing roadbed, and other exclusions applied automatically. Automated determination of rock cut/fill or earth cut/fill w/option to override/force one set of parameter values. Also includes options to automatically correct for geometric issues in rock/earth parameter determination. Cut/Fill shapes properly account for stripping layers to facilitate quantity calculations. Rock Shatter layer where appropriate. A ‘rock shatter’ layer is modeled below the datum when the datum is below the sampled rock subsurface. This layer is ‘clipped’ against an upper bound calculated by sampling the rock subsurface. All quantities can be calculated with a single Sample Line Group and the material definition list can include, Stripping, Earth Excavation, Earth Fill, Rock Excavation, Rock Fill, and Rock Shatter.